When the William & Mary Griffin traveled to the Virginia Institute of Marine Science in mid-April, the mythological creature likely never thought it would leave with a new understanding of its own genealogy. 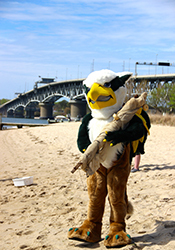 The Griffin made its first-ever trip to W&M’s School of Marine Science at VIMS to learn about how faculty and graduate students work to identify and address the many challenges facing Chesapeake Bay and the world’s oceans. The visit also provided some striking photos in support of W&M’s One Tribe One Day fundraising effort on April 21. The One Tribe One Day event was successful beyond all expectations, raising more than $1.3 million from 6,078 donors, including 71 with gifts specifically earmarked for VIMS. Hundreds of volunteers built momentum on social media, through personal outreach and at 22 events from Tokyo to San Francisco. 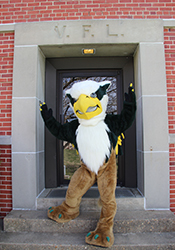 While at VIMS, the Griffin enjoyed a whirlwind tour of the 42-acre riverfront campus. The visit included a high-level consultation with VIMS Dean and Director John Wells, a stop in the Hargis Library to review VIMS’ contributions to the recent marine science literature, a peek at some of the 128,000 specimens in the VIMS Fish Collection, a look at a high-tech underwater glider, a seat in a statistics lecture, and an inspection of VIMS’ research fleet and the flagship research vessel Bay Eagle. The Griffin’s most enlightening stop, however, was likely the Fisheries Genetics Lab, where it consented to provide a DNA sample to the curious researchers. Technicians and students in the lab use DNA collected from both real and imaginary creatures to throw light on their geographic distributions, population structure, and evolutionary origins. An example is the lab’s cutting-edge work to determine the population structure of tunas and marlins in the Atlantic Ocean, with important implications for conservation and international fisheries management. Analysis of the Griffin’s DNA sample, extracted from one of its secondary flight feathers, revealed a shocker: in addition to the expected hybrid of DNA from known lion and eagle ancestors, the Griffin’s evolutionary roots apparently extend to the marine realm as well, including creatures such as the Lion’s Mane jellyfish and spotted eagle ray. The researchers also found genetic markers from the lionfish, sea lion, and African sea-eagle. Somewhat shocked by the unexpected news, the Griffin flew the short distance to VIMS’ OspreyCam nest, where it engaged in some heart-to-heart chatter with the resident fish hawk, itself a creature of both air and water. The Griffin returned to the VIMS Pier apparently mollified and refreshed, ready for a return visit to Gloucester Point and the York River in the near future to spend more time with its new-found tribe.